As the weather turns colder, it’s time to get your non-hardy plants and tropicals ready to go back inside the house for the winter. When temperatures are lower than 50 degrees consistently, it is the time to bring your plants indoors. You want to bring them indoors before the weather turns too cold. And, always keep an eye open for an early frost. 1.) 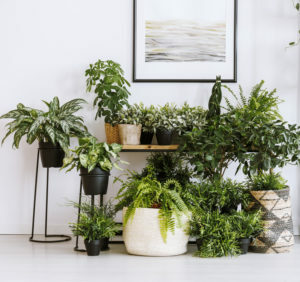 The first thing to do if it is possible is to move your tropical or non-hardy plants into a shady location outside and leave them there for 10 days to 2 weeks. It helps to acclimate them to the lower light conditions they’ll be receiving once inside your home. By the way, during this time, do be aware of possible cold temperatures and even frosts, where your plants will need extra protection! 1) Hose them off with a strong stream of water to remove any insects that may be on your plants. 3) If possible, lay the plant on its side, slide it out of the pot, and inspect the root ball for any unwanted bugs or anything else that may be hiding in the bottom of the container. Rodents, even snakes have been found hiding here. Away to make sure nothing is in the soil (ants, etc.) is to fill a large tub with water, and then submerge the plant pot and all in the water for several hours. Anything in the soil will either drown or will float to the top of the water. It’s also a great way to soak the soil. Just make sure you allow it plenty of time to drain before bringing it into the house. 3.) Move your tropical plant indoors to a well-lit area indoors, and away from heat vents and cold drafts. Place a saucer under the pot. As a general rule, water the plants well with lukewarm water, let it dry and water again. Also, never let water sit in the saucer. 4.) Expect leaves to drop as the plants make their final acclimation to the indoor lighting. It’s natural. So do keep your eyes open for any flare-ups of insects on the plants. Keep insecticidal soaps, systemic insecticides, and whitefly traps on hand just in case. 5.) Reduce feeding to an occasional shot of water-soluble fertilizer, which can increase once the days start to get longer, come next spring! Again, do expect leaves to fall once the plants are inside, as the sunlight isn’t what it was outside. Stick with them, water only as needed, watch for outbreaks of insects and catch them early, and your tropical plants should make it through the winter, and be ready to get back outside late next spring. We also suggest a good rinsing off several times through the winter, and the shower is the perfect place to do it! Knocks off many bugs, cleans the leaves, and the plants love the water and the humidity in the shower. Use luke-warm water, and let them shower for 5-10 minutes.